They find me... in the kitchen. It is one of their favorite tasks to join in on. It is simply part of our experience as a family. when they spill the flour all over or splatter the batter on the floor. Sometimes, there is the infamous, "Ugh..." that slips out. but it is simple in the joy it brings about. making a mess of toys or crayons. The more I cook with my kids, the better it gets. They learn the rules, and the spills and splatters get less and less. 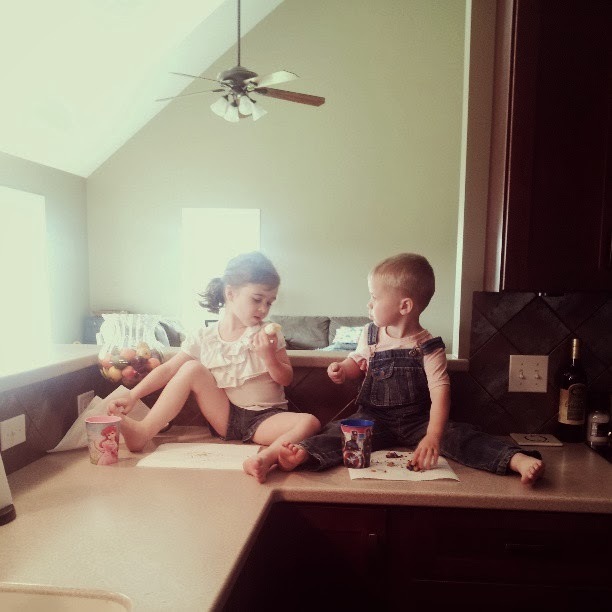 At this place in our lives, they know they are welcome on my counter any time. It sprinkles a little sweetness on our mornings. ummm... yep. so much quicker! it's nice to have some solitude- for sure! same here. and I love kids in the kitchen. the heart of the home indeed. i pretty much feel like i should just camp out in the kitchen. we're always in there! :) thanks for stopping by!